Another weekend is upon us! You know what that means – kicking back, unwinding from a busy back-to-school week, and making this creamy pumpkin pie smoothie to reward all your hard efforts. Whoever said you shouldn’t reward yourself with food really needs to try this smoothie. Seriously! Thanks to adding soaked rolled oats and chia seeds, this smoothie is extra thick and has a bit more staying power than most. I think it’s my best pumpkin smoothie to date! Enjoy it for a snack, breakfast, or even dessert. If it’s still hot where you are like it is here, you might find yourself cooling off with this smoothie outside. Extra ice, is a must. Oh, and if you are feeling crazy top it all off with some homemade Coconut Whipped Cream – I know you’ve been waiting for the perfect recipe! Adapted from Pumpkin Pie Smoothie & Pumpkin Gingerbread Smoothie. 1. In a medium-sized bowl whisk together the milk, oats, and chia seeds. Place in fridge for 1 hour or preferably overnight. 2. Add soaked oat mixture to blender along with the pumpkin, molasses, frozen banana, and spices. Blend until smooth. Add about 5 ice cubes and blend until ice cold. 3. Add maple syrup to taste. I found 1.5 tbsp was perfect for me. 4. Serve with Coconut Whipped Cream and a sprinkle of cinnamon on top! I want to take a moment today to fill you in on an advertising change that happened on my site as of Sept. 1st. I’m now with Federated Media in a non-exclusive agreement meaning that I can host my own advertising as well as ad campaigns from FM and other networks, such as AdSense. There have been some kinks to iron out over the past few days (to say the least), so I thought I’d fill you in on what’s going on. I have committed myself to providing meat and dairy-free advertising on Oh She Glows. This is an ethical choice that fits with my vegan lifestyle and vision for the blog. I can’t promise the ads will always be perfect, but I’m going to do the best that I can to keep blatant meat and dairy ads off the site. Thankfully this was agreed upon with my advertiser before we went live on Sept 1st, but on Wednesday I found out a meat ad was in fact running on my site in the US. Many of the ad campaigns are only shown on U.S. IP addresses, so I had no idea this was going on. I shut down all of my ads for a few hours until they were removed. This is certainly not the first time that meat and dairy ads have appeared without my knowledge. With my previous advertiser, I had no control over which ads were displayed. I ended up emailing them from time-to-time to ask for removal of animal/dairy ads or specific ads which did not fit with my vision for the site. However, I could only do so if my US readers made me aware they were running. It was by no means a good system. The good news is I now have my FM ad campaigns set to “manual approval” so nothing should run without my approval. I’ve already declined several meat and dairy ad campaigns over the past few days, so things should be looking better around here. I’m also trying to keep the Google Ads non-offensive. I’ve blocked many categories so far including weight loss gimmicks, diet pill, and wrinkle cream ads. Keep in mind, ads can slide through under vague categories so they may pop up from time to time. I want to encourage you to contact us if you see any ad that is concerning or offensive. Send to: adinquiries [at] ohsheglows [dot] com along with a screenshot and URL of the ad. Like I said, we can’t catch everything so your help is appreciated. I can now sell ads for my site. My goal is to advertise animal-friendly businesses supporting the vegan lifestyle. There are so many amazing companies out there (and growing every day!) and I would love to feature them on the blog. If you know of any businesses, large or small, that may be interested in advertising on OSG, please let us know: adinquires [at] ohsheglows [dot] com You know what they say – you have to put it out in the universe for it to happen. It often feels like an uphill battle when double whopper ads are the norm, but I’m confident that we can make progress in this area. As always, thank you for your patience during this time of transition! Can’t wait to try this smoothie girl, it looks like Fall in a Glass…..sigh. Where did my summer go?! Love that you are fulfilling your dreams here with your blog and brand! You deserve ever piece of it!! I don’t think I’ve ever seen a more decedent smoothie. Wow. I pinned your coconut cream to try – I bet it’s perfect on this. I used it on my Key Like Pie smoothie the other day and it was delish! Ugh – good luck with the ads. That sounds like a real headache! Aw, I wish I could get canned pumpkin where I live. I know you can make it yourself – but it takes some time. Good luck with the new ads! Oh, and a quick story: I brought your tortilla soup for lunch at work today, and a fellow teacher kept staring at it and sniffing the aroma. Finally, he leaned over and asked me where I got the recipe. Turns out, he reads your blog too, and he knew your tortilla soup just from the delicious smell!! Small world :) Thanks for all you do! You had me at molasses. I’m craving that stuff BIG TIME!! Are you encouraging just Canadian vegan businesses or anyone with an online site? There’s a great vegan bakery in town I’ve got in mind but wanted to check first. Good for you for sticking to your beliefs & not posting meat/dairy ads. Keep up the great work, Angela! Have a fantastic weekend!! It is so encouraging to see that you won’t allow just any sponsors to advertise. I couldn’t agree more – I think the more pressure we put on these businesses & ad networks to source quality products, (hopefully) the more it will improve over time. It’s tricky because it’s often the huge meat & dairy companies who have all the $$$$$$, but I still think it’s important to try. I am so glad you are standing up for ethical advertising! I am all for seeing tasteful ads on blogs where a wonderful service is being given free of charge, like your wonderful recipes. I know a vegan business owner, I will suggest that she advertises with you! And I love your smoothie! Adding molasses is a great way to up the iron content! Thank you, Sarina I appreciate that! Wow! I am making this recipe this weekend, I am so excited for the crisp clean fall air. I am happy to see that only vegan friendly ads will be showing on your blog, it is a perfect direction for you. Have a great weekend! Serves 2? You must be more generous with your pumpkin than me! I could lick the screen right now! I am glad you posted this. I think I may have contacted you about a meat ad on your blog and never heard anything back about it, so I assumed you didn’t care. I am glad you addressed it because obviously it does mean something to you. It is tiring to see ads that don’t fit in with the blogger’s beliefs and it just makes me think they only care about the money. So I am glad you are trying to find things that fit your beliefs and interests of your readers. Yumilicious…..I can’t wait to give this a try!! Yum! I have a flu bug and this is the first thing that looks appetizing. Also, thank you for keeping you blog real. Your blog is one of the few I enjoy reading these days as an almost 30 year old, I can only stomach so many hubby and me outstretched arm shots, and fashion Friday posts =) I can always handle more pumpkin recipes for two. Good luck with your cookbook….can’t wait to see it! Glad to hear that Sarah. I hope you feel better soon! An absolutely beautifully styled post…..such talent…..I feel fall in the air…. Ohh i have been seeing ads here the past couple of days and thought it was something wrong with my computer lol. I live in the US and have only seen ads for HP computer products. I don’t mind the ads at all and even if a wrinkle cream or diet pill ad slips in every now and then I wouldn’t care, still better then some of the other ads on some sites if you know what i mean. In other news…suuper excited to try this smoothie! I am wanting pumpkin things because it’s September, but it’s still 96 degrees here. Perfect solution Angela!! Hey Catherine, Yes we had a problem with a HP ad. I meant to put that in my post! As it turns out, there was an error in the ad code they gave us, so we removed it. I’m sorry for the inconvenience! Good luck on the advertising issues – I can only imagine how hard it is to control ads in a country you’re not living in and I know that what I see from moment to moment, page refresh to page refresh on my own site changes so can only imagine the chaos you must be feeling with it all. What a fantastic sounding (and looking) smoothie! I’m SO making this tomorrow!! Wow! I would love to not see belly fat ads everywhere! I think they’re women’s version of ED ads. Thanks for using your power for good! I agree – I am so sick of seeing them everywhere too. Just wanted to tell you I love your blog and recipies, have followed forever. Today I made your protein power oatmeal bars and dark chocolate cherry energy bites! Both are awesome recipies! So excited for your pumpking smoothie that was posted today, and made your coconut whipped cream the other day, both my hubby and I gobbled it up. Also, made the original peppermint patty bars and just about died and went to heaven – as did my mom and sis who gobbled them up too!!!!! Thanks for all your hardwork recpie inventing! Thank you Kate! Sounds like you have been a busy woman! Your family sounds like they are reaping the rewards of all your hard work. Hello yummy!!! This is a perfect way to enjoy pumpkin since we are still lucky enough to have really warm temperatures!! This will tide me over until pumpkin spice lattes start showing their lovely little faces at Starbucks & Coffee Culture! Great news about the advertising on your blog. I love seeing your site grow and grow – it inspires me to keep working on my own site/brand because the possibilities are limitless!! Mmm… So delicious! Pumpkin truly does scream fall. LOVE. Looks perfect for fall! I think that is great you are filtering your ads. I’m not always happy with a lot of gimmick ads that pop up on sites. Your site always looks so beautiful. I know you do your own, but do you know of a good/reasonable blog site designer? I know a lot of people use the Blog Fairy and also Zesty Cook. I haven’t used their services though. Goodluck! 1. Your husband doesn’t like pumpkin?! Craziness. 2. I really admire you for what you are doing with the ads. I know of too many blogs/bloggers that let whatever ads onto their blogs, even though they don’t fit with their “philosophy” or theme of the blog, just to make money. So I really appreciate what you are doing! Hey Angela – thanks for the recipe! I’ve been planning a pumpkin smoothie in my head for the past few weeks, in anticipation of the cooler weather. Have you ever tried freezing the pumpkin? I’m wondering how that would work out. I don’t do oats so I’m trying to come up with a solution to help thicken it without watering it down. Thanks! I haven’t tried freezing it, but I was just thinking about it this week, wondering if it might change the texture at all. It might be worth a shot. I’ll have to try it out and let you know how it goes! I’ve frozen pumpkin puree for years! It freezes beautifully and doesn’t change at all. This smoothie looks amazing! I am sooo excited for fall flavors, I can’t even stand it. Regarding the advertising, I have to say I am very impressed by your choice to be so in control of your advertising. It is so admirable. I myself have considered advertising on my site, but I am a conscientious omnivore that eats mostly vegan, and when I do eat meat I want it to come from a local farmer that raises his animals on pasture and without the use of hormones, antibiotics, etc. I also avoid dairy and don’t consume any processed foods. I don’t want my site littered with crap being force down my reader’s throats that I would never myself endorse and I actually find that to be a huge turn-off on sites that I do choose to read. I really admire your choice to be so hands-on and to not just cash the checks and take it, no matter where it comes from. So kudos to you and good to know there are options out there where I can be in control. I am looking forward to exploring them more when I get to that point. Thanks for sharing and thanks for an awesome site! Thanks for your feedback Beth. It is a difficult situation to navigate – one that I have been frustrated with for a while. I’m so glad I spoke about it though because comments like yours and others remind me that it’s not something I struggle with alone. I can understand your own dilemma with ads. Goodluck with your own goals! You are doing such an incredible job on your site. Not only are your recipes inspiring, but your commitment to what you believe and how you conduct your life are a complete inspiration. 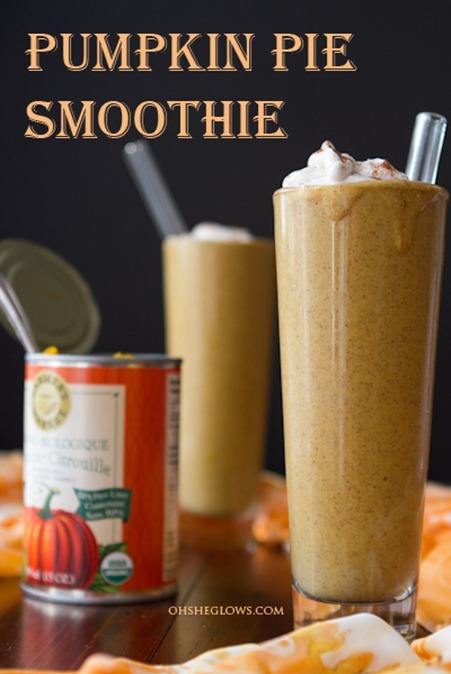 This smoothie looks delicious, looks like I need to cook and puree another pumpkin!! Thank you Christa. I certainly don’t feel like I’ve mastered it yet, but just trying to figure it out as I go! I will be cooking my second sugar pumpkin this weekend…I think I just might puree it too. There is a Nestle Tollhouse ad up right now as I type. Not sure if this bothers you… I think trying to match the mission of this blog with the advertising on it is great! I was told that ad was blocked…I guess it wasn’t! Thanks for letting me know…I can’t see it here. Hi Angela! Can I use fresh pumpkin instead of canned one? How do I process it if so? Hugs all the way from PL. Great question – Im not sure. You could try adding a little bit of fresh pumpkin into the blender at a time. Im not sure if it would impact the flavour, my guess is that it might. You can always adjust to taste though! Let me know if you try it out. This looks delicious! Love the coconut whipped cream, too. This smoothie looks so good! A few days ago I opened a huge can of pumpkin for another recipe, and I’ve been looking for new ways to use it up. This looks perfect, and it will give me an excuse to make your coconut whipped cream too! Thanks for letting me know! It was supposed to be blocked, but I guess they missed it. I emailed them last night (as someone else told me about it) and it should be removed now. I am SO thankful I found you! I actually feel like I could become a vegan -with my family- and all would be happy! Do you use sweetened almond milk with this recipe? Hey Jennifer, I usually use unsweetened almond milk, and sweeten it after, but you can use either! I would suggest using dates in place of the banana. The oat mixture will already thicken it quite a bit, so it should still work. Just add them to taste. Goodluck! Love pumpkin!! Love that it is fall!! This is a must try!! Can’t wait to try this. I have a question about chia seeds. There seems to be a shortage of the black chia seeds in my area of Calif. I have some white chia seeds and they don’t seem to thicken as much as the black ones. Do you use black or white chia seeds in your recipes? Hello Tracy, I thought i’d chime in here. I use black and white chia interchangeably in most of my recipes. Also I often grind them first (I keep some pre-ground chia in a separate tub) and that gives much more of a thickening action than unground. Interesting to understand your advertising decisions, good choices. I’m currently looking into advertising on my currently advert-free blog, i’m finding it such a minefield to know where to start and all the small print and contracts etc confuse me. I too want to make sure any advertising stays true to my philosophy. Also i’m a UK blogger yet most of my readers (about 75%) are US based so that makes me even more confused! I love that you’re so particular with your ads!! Green companies need all the help they can get. What an inspiration. Your pumpkin smoothie looks amazing!!! Great job on negotiations for advertising!! I love that you can pick and choose your ads and go with more then one publisher. Have a great weekend!! I need to buy pumpkin ASAP! I can’t wait to enjoy this on chilly fall mornings yum! Food rewards! Also this post just reminded me that yes, it is that time of year when I can consume pumpkin again (it just feels wrong to in Spring). That’s a good revelation to have at 7 in the morning. :) Oh and I wanted to mention, thanks for the coconut whip tutorial, it’s one of those things that intimidates me for no apparent reason but I’ve got some coconut milk in the fridge, waiting for its moment! It’s gonna happen! And kudos on the integrity with the ads! This smoothie looks so good. I just ordered lots of pumpkin in anticipation of many different Fall pumpkin treats. I just cannot seem to make it while it is 80 degrees out though. This post did inspire me to use smoothies as a snack/dessert too. I am addicted to my morning green monster so I then do not experiment with the other great smoothies I see . I will surely be making this as an afternoon snack very soon – thank you!!!! GREAT pumpkin recipe!!!!! I will have to cut in half,because I`m watching the calorie intake and there is no one else in my house that enjoys pumpkin. And thank you for your integrity, it`s so seldom this days. Angela, I LOVE your new look here! I have followed your blog for a long time and this is a beautiful update! I just tried the smoothie. I love it! I’m not a huge banana fan, so I just added less banana & more pumpkin. Delicious. I’m so excited it’s pumpkin season. This looks absolutely delicious! I’m a big pumpkin fan, so this smoothie immediately caught my eye. YUM! Do you have any suggestions for a molasses substitute, though? I don’t happen to have any in my house! :-) Maybe I need to head down to the market. You can make it without the molasses – it will still taste good. But yes do try it with molasses when you pick some up! This recipe looks really great and I’d love to try it. My problem is that I have a banana allergy. Do you have any suggestions for substitution? Oh- yum! I make my pumpkin pie smoothie in a very similar fashion- but haven’t used molasses in it… I’ll have to try that. I love pairing pumpkin with blackstrap molasses. This smoothie is a great way to welcome the glorious coming of autumn! Love this smoothie! I’m really excited about fall and fall recipes! I will have to make it SOON! You are so smart to be selective about your ads. Thanks for sharing your thoughts! I guess you could drink this any time during the year. What a great fall find. I wonder could you use fresh pumpkin? Now I love this blog even more! Good for you – someday (I hope soon) the balance will shift and being a vegan won’t be such an uphill battle. And it will be because of people like you! Hi from Arizona! My family and I love your website! I made this recipe for me and my husband this morning….wow, so filling! I usually get hungry a few hours after eating breakfast but this one had serious staying power! I must say though my favorite recipe on your blog is salt and vinegar chickpeas…Ah-Mazing!!! Thanks for all the great ideas. Thank you Jen, it’s a pleasure to meet you! I soaked my oats overnight but there was still a lot of milk left that wasn’t absorbed. Is that normal? Or are my oats old and not with the program? 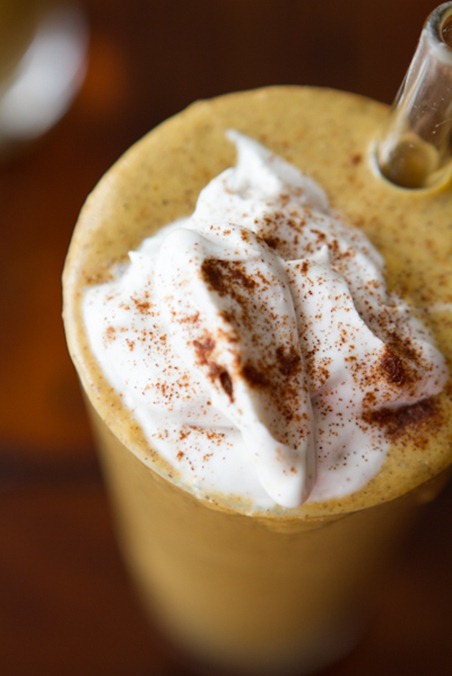 I love pumpkin in smoothies and this one looks amazing especially with the whipped cream on top :) Hope you had a great weekend! I didn’t read the directions early enough to soak anything longer than 10 minutes but it came out absolutely delicious. I made it for my boyfriend and a friend who is allergic to nearly everything. Nate: mmmm…this would be really good with rum. I would have made the coconut whipped topping but I only have light coconut milk and I respect you too much. Wow, I am making this today! Brilliant! Made this yesterday and it was delicious! And also kind of addicting :) Love the thick velvety texture. 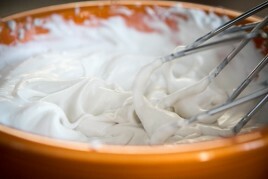 Don’t leave out the coconut whipped cream!! Guess what I made for breakfast this morning? And I am so glad I did!!! I love all things pumpkin and this was a wonderfully delicious way to start my day. So incredibly yummy!! Didn’t change a thing but half the recipe since it was just for me and now I am so bummed I halved it…. I am already craving more! This might have to be lunch too!! Thank you!!! This smoothie looks AMAZING, I’ll definitely have to try it soon! The smoothie was amazing! Lighter and less sweet than I anticipated. The smoothie sounds delicious and I really want to make. However, since I was a little girl I have not been able to eat bananas. I can thank big pharmaceutical for putting out children’s medicine that tastes like bananas. What were they thinking?! I digress, but my question is, can you taste the banana? Hey Jaime, You can taste the banana slightly – however if you don’t want that in there I would try using dates (sock them if they are firm before use) Enjoy! Looks delicious. Any suggestion for someone who can not have oats? hmm what about a different kind of flake like quinoa flakes? 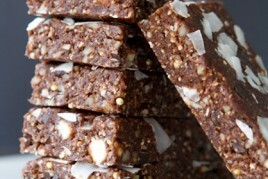 Or soaked raw buckwheat groats? This smoothie was so good, I almost cried. Thanks! I made it without the chia as I was starving but had to run out to pick up my son. Delish! I made this yesterday- it was sooooooooooooo good!! I am currently sipping on this and I am in heaven. It tastes EXACTLY like pumpkin pie! You’re a genius. I love how thick it is, makes it feel so decadent. I halved the recipe (since I only had 1/2 cup of pumpkin) but this is definitely going into my fall smoothie rotation. What a great way to get a Vitamin A kick in the morning! I am loving this smoothie right now and so does my 11/2 year old daughter!! Thank you! I have to tell you, I made this into overnight oats for my fam of 4. I didnt have time in the morning to make a smoothie. Huge hit! It was yummy! Looks Yummy!! Can the molasses be substituted with something else?? Heylo! I made this as a dessert for my friend and I — minus the coconut whipped cream — I didn’t have the coconut (FULL FAT BTW) chilled so I didn’t want it to flop. I wanted to tell you that we thoroughly enjoyed this, and I will be making it many times over! Thank you for your care, and talent!! Angela: I just saw a Dr Oetker ad on this page for pizza. Just letting you know. The smoothie is delicious! Excellent smoothie. I added a touch of agave nectar because I like it a smidge sweeter. I just found your site & am so impressed! You are clearly making an impact as you educate folks about the power of healthy food… wonderful. I would strongly & respectfully support our shift towards fresh pumpkin (including home-frozen or canned), especially as we consider our carbon footprints and rejection of GMO foods. Short term convenience has been such a painful injury to our incredible food system. Plus it’s wicked fun to put up pumpkin each fall! Is there something I can use instead of the oats? How essential are they to the recipe? I’ve been following your blog for a while now and I LOVE this amazing smoothie so much I had to finally post a comment. I have to admit though I ran out of pumpkin one day and got desperate so I substituted a big apple and it turned out AMAZING! My hubs and 4 out of our 5 kiddies love it so I now have to triple my batches so that i can actually get some :). My teen thinks he’s too cool to try it but i’m not giving up on him! Thanks so much, Im glad to hear that! I made this for breakfast this morning (half recipe) and it was incredible!! I just wanted to let you know, next time you make some pumpkin butter, you should try subbing it in for the canned pumpkin. I have canned pumpkin, but my pumpkin butter was in the fridge and used similar spices so I thought, why not? I cut down on the spices, skipped the molasses and used just a little maple syrup, and stirred in a tablespoon of oats at the end for texture. It was decadent! Oohhh this sounds really delicious. I love pumpkin! Where did you get the straws from? I could really use something like this! Thanks for posting such amazing recipes! I made your lentil walnut loaf and shepherds pie with the walnut meat over the holidays! It was a huge hit with meat and vegan lovers a like! I also love that you’re blog includes fitness musings and writings! I was wondering if the canned pumpkin could be substituted with fresh pumpkin in this recipe? Yum, again! 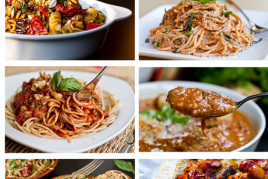 I’ve lost track of how many delicious recipes I’ve made – all from you! I made this yesterday morning, and it was so good. Every morning my little one year old son and I share a smoothie. I’d love to make this one for him, but he seems to be sensitive to oatmeal. 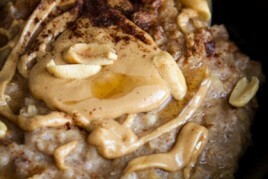 Would leaving out the oatmeal be a crucial error – or do you think it would be okay? Canned Pumpkin doesn’t seem to be available in Australia! Would it be just like boiling pumpkin? Thank you so much for this smoothie! I had some technical difficulties with my blender but persevered with my food processor. No oats and less than perfectly chilled coconut whip cream – yet it was still great. As a very new vegan, it was wonderful to knock back such a tasty and filling treat. Made this last night. Brilliant. This smoothie was awesome!! I was so shocked how the consistency was like a pudding after blending it. Since I LOVE pumpkin pie, this was perfect. My husband thought it was very filling, almost fit as a desert. However, I plan to use it as both a desert and a morning treat. I have used chia seeds, but usually drink them quickly before the get too plump. This has opened my world to possibilities. Thanks for the sharing! I read through as many comments as I could, but I didn’t see the answer to my question. Is there any substitute for the rolled oats? We are avoiding all grains for now. Yum, I used this as inspiration for my Fourth of July breakfast (hey, it’s not everyday you get canned pumpkin in the UK!!) posted on my blog today. Mmmmm! So I made this smoothie today (yeah I know, not fall yet) but I just couldn’t get myself to like it. The pumpkin and spices cannot cover the taste of the banana, and I am a serious banana hater. What can I substitute in this smoothie or smoothies in general to get the same smoothie texture without having to deal with the atrocious banana taste? Hey Olivia, What about coconut milk + dates? Thank you! Thank you! Thank you! I am “converting” to the Vegan lifestyle and your website has made it so easy and DELICIOUS! My kids are going crazy over your recipes! I appreciate you taking the time to do this.. This smoothie was freaking awesome! Thanks again! Im so happy to hear that Manda! I just made this for the first time and loved it!!! My coconut milk didn’t solidify so I just added some of the froth to the top of the smoothie, cappuccino style. Will the leftover smoothie store in the refrigerator for few days? Wow! I thought the Cake Batter Smoothie was my all time favorite, but this one may have edged it out, so delicious! My girlfriend is making me write u a comment because I licked the bowl after I ate most of the whipped cream. These were fantastic! I substituted 1% milk and added in so e whey protein to make them even healthier and tastier and they were out of this world. Hi! I do not care for almond milk. Would 1 percent or skim milk work for the pumpkin smoothie? I have to say I usually ignore ads on sights like these. But after reading your post about your new ads and your goals, I was curious and scrolled back up to actually look at the ads. And… at the very top of the page was an ad for Butterball Turkey. After I chuckled, I thought you might like to know. Hi Kathleen, We’ve blocked hundreds of brands and categories through our ad networks, so this shouldn’t be happening. Unfortunately we can’t see all of the ads that run in other countries, so I do appreciate you letting me know. We’ll have it removed shortly. In the future, it really helps if you send us the link too (just helps with locating the ad quicker) Thanks again! I just came across this recipe and being the pumpkin lover that I am I can’t wait to try it out! I absolutely hate bananas though, so I’m curious if you can taste the banana flavor? Would it work if I left that out? If you were to choose a smoothie Maker Angela. What do you think of these? Would any of these be your hot pic? i just love pumpkin! i will surely give this a try! thank you! I am enjoying this delicious smoothie, on a hot summer Australian day, and just loving it! I think your recipes should come with a warning – they are just so delicious, and mildly addictive. I will be making your pumpkin butter during the weekend and can hardly wait to try it. Thanks for your recipes. This smoothie is a breakfast staple in my house at least once a week! Thanks for sharing. PS: It’s inspiring to see someone putting effort into supporting ads that are in alignment with their ethics. I see a lot of delicious looking/sounding recepies for smoothies and deserts with plant based ingredients. My question as a new, not so lost anymore Vegan, why none of these recipes document calorie count? Do the calories just not matter because they are so insignificant? I really don’t have a handle on if I can get a way with consuming 2 cups of this delicious Pumkin Pie Smoothie, or should it be limited to one. What is the serving size and what is the calorie count for one serving? Is it possible to do this without the banana or substitute something else in its place? Where I currently live in Japan, canned pumpkin is not something readily available. However, Japanese pumpkins called kabocha are year round. Feeling adventurous, I made this recipe with a bag of frozen pumpkin chunks. The end result? Delicious pumpkin pie ice cream. Just thought I’d share another way to enjoy this wonderful recipe. Is there a way to nix the banana? I can’t eat them. Suggestions for a good substitute? Another one to add to my Vega Pinterest ‘Best Smoothie’ board. I just made the velvety pumpkin pie smoothie from your cookbook and it is honestly the most delicious thing I’ve had this fall! I would love to be fully vegan or vegetarian, but I have a serious nut/seed allergy and it is really frustrating to go through recipes and almost everything has nut or seed in it. I don’t know how I could enjoy eating food and have this allergy while trying to be vegan or vegetarian! And, I like food. My alternative is to eat as healthy as possible and try to source responsible meat and fish when I cook with it. Hi Angela, I have tried to contact you several times via email, twitter and Facebook about advertising/partnership opportunities. I am a ten-year ethical vegan working for a retailer that I believe would align with your ethics. I’d really love to hear back from you sometime. You can email me at pamela dot tourigny at terra20 dot com. Look really delicious wanna try it!!!! here in thee early hours inn the morning, since i enjoy to gain knowledge of more and more. 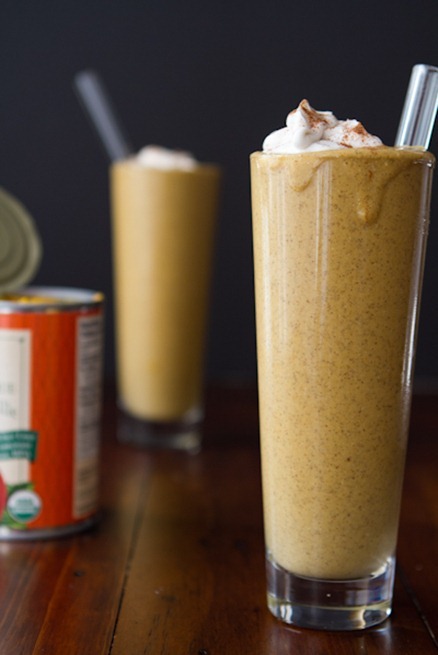 Isn’t this the same smoothie as this one: http://ohsheglows.com/2011/10/12/pumpkin-gingerbread-smoothie/ ? Made this today for breakfast with frozen delicata squash and unsweetened vanilla almond milk. It was amazing!! My picky fiancé loved it and even chose it over a meaty restaurant breakfast. Then he even asked me to start sending it with him in the mornings on work days. I thought I would need to add some sugar, but it turned out wholesome and perfect without adding any. Definitely making it again and again and again. This was a fantastic smoothie! Even my wife, who always says she is sick of smoothies, came back looking for more. I was thinking that using a soaked date or two instead of the maple syrup, would be more “whole food” which is always a goal of mine. Thank you so much for creating these wonderful recipes! 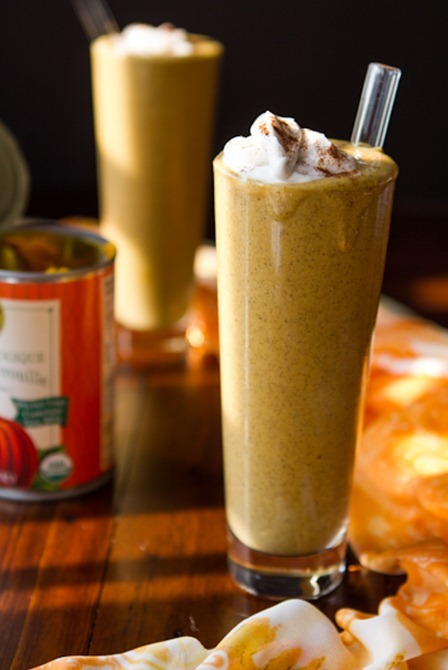 Nothing like a pumpkin pie smoothie thanks for sharing going to have to try this out this weekend.